U.S. rejects Iran's accusation, mourns "loss of innocent lives"
TEHRAN, Iran (CNN) -- A man carrying explosives blew himself up as participants headed to a conference between Shia and Sunni groups in southeastern Iran on Sunday, killing at least 29 people, Iranian media reported. 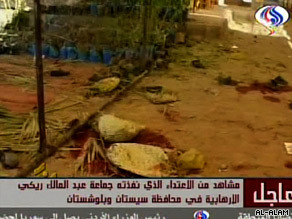 Images from Iranian TV show debris and carnage from a suicide bombing Sunday in Sarbaz. The blast in Sarbaz in the province of Sistan-Baluchestan wounded 28 others, the semi-official Fars news agency said. Among those killed were five senior officers of Iran's elite Revolutionary Guard Corps, Fars said. Other media outlets offered conflicting figures for the number of dead and wounded. Among the officers killed was Nour-Ali Shoushtari, the deputy head of the Corps' ground forces, who was in the province to mediate between the two sides, Fars said. The terrorist group Jundallah -- also known as the People's Resistance Movement of Iran -- claimed responsibility for the attack, according to state-run Press TV. In the past, the predominantly Shiite central government in Tehran has accused Jundallah of fomenting unrest in the province. Iran has alleged that the United States and Saudi Arabia are funding the group. Jundallah says that it is fighting for the rights of Sunni Muslims in the country. Earlier, Iran pointed the finger at the United States without disclosing its reasons. "We consider this recent terrorist act to be the result of the U.S. actions and this is a sign of their enmity," said parliament Speaker Ali Larijani. A U.S. State Department spokesman said the accusation was "completely false." "We condemn this act of terrorism and mourn the loss of innocent lives. Reports of alleged U.S. involvement are completely false," Ian Kelly told CNN. The United Kingdom also condemned the attack. "The British Government condemns the terrorist attack ... in Iran and the sad loss of life which it caused," the Foreign Office said in a statement. "Terrorism is abhorrent wherever it occurs. Our sympathies go to those who have been killed or injured in the attack and their families." "We reject in the strongest terms any assertion that this was anything to do with the U.K.," the Foreign Office said later in response to reports Iran was accusing London of responsibility. However, the semi-official Iranian Students News Agency reported that Pakistan's ambassador was summoned to the Iranian Foreign Ministry, where he was directed to tell his government to expedite efforts to arrest people on the other side of the border who may be responsible for the attack. The Pakistani government didn't directly respond to Ahmadinejad's remarks, but Pakistani President Asif Ali Zardari "strongly condemned the suicide attack," according to state-run Associated Press of Pakistan. Zardari also said he planned to work with Iran to "curb militancy and exterminate militants," APP reported. The attack was one of the largest in recent years on the Revolutionary Guard. Three days of public mourning will begin Monday in Sistan-Baluchestan, IRNA reported. Around the same time of the blast in Sarbaz, a second group of Corps' commanders was caught in an explosion when their convoy came under attack at a road intersection between the towns of Sarbaz and Chabahar, state-run Press TV said. The station did not say whether the second attack resulted in casualties. The Guard was initially created to protect the leaders of the revolution. But over the years, it has broadened its scope. Today, it is directly under the control of the supreme leader and enforces the governments' Islamic codes and morality. With an estimated 200,000-plus members, it is tasked with overseeing the country's crucial interests, including guarding its oil fields and missile arsenals. CNN's Shirzad Bozorgmehr and Jill Dougherty in Washington contributed to this report.